Near-drowning is defined as survival for at least 24 hours from suffocation by submersion. Aspiration of water causes plasma to be pulled into the lungs, resulting in hypoxemia, acidosis, and hypovolemia. Hypoxemia results from the decrease in pulmonary surfactant caused by the absorbed water that leads to damage of the pulmonary capillary membrane. Severe hypoxia can also result from asphyxia related to submersion without aspiration of fluid. 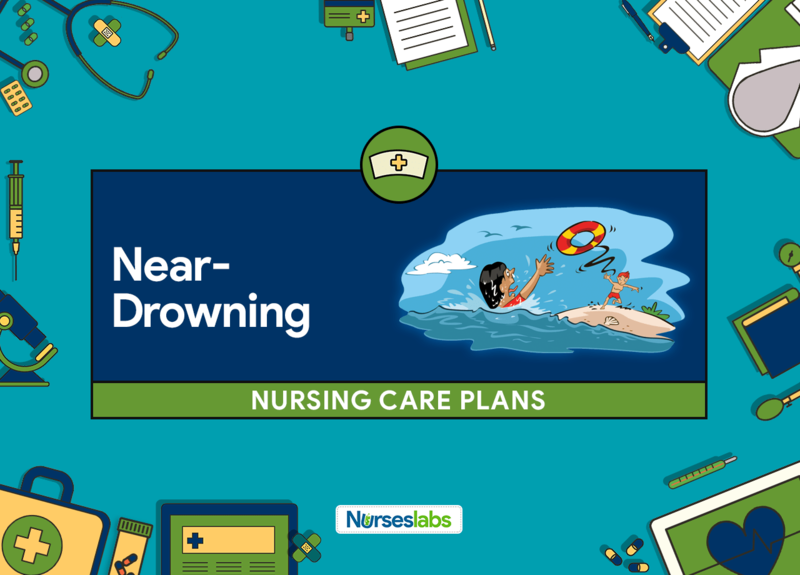 Factors associated with near-drowning include an inability to swim, accidents/injuries, alcohol use, underlying seizure disorder or cardiac dysrhythmia, hyperventilation, and hypothermia. A client who has nearly drowned may be unresponsive. Other symptoms may include cold or pale skin, abdominal swelling, vomiting, cough with pink, frothy sputum, shortness or lack of breath, lethargy, and chest pain. Freshwater drownings are far more common than saltwater drownings. Fresh water usually results in surfactant loss, and hence, producing areas of atelectasis. Saltwater aspiration, on the other hand, results in pulmonary edema due to the osmotic effects of the salt within the lung. Therapeutic goals for a client who has nearly drowned include providing adequate oxygenation, maintaining a patent airway, maintaining cerebral perfusion, continuous monitoring, providing rewarming methods, and absence of complications. Client will maintain optimal gas exchange, as evidenced by arterial blood gases (ABGs) within client’s usual range, oxygen saturation of 90% or higher, alert, responsive mentation or no further decline in the level of consciousness, relaxed breathing, and baseline heart rate for the client. Assess the client’s level of consciousness. Within three minutes of submersion, near-drowning clients are unconscious and are at risk for cerebral edema. Assess the client’s respiratory rate, depth, and rhythm. Changes in the respiratory rate and rhythm are early warning signs of impending respiratory difficulties. Impairment of gas exchange can result in both rapid, shallow breathing patterns and hypoventilation. Hypoxia is associated with increased breathing effort. Auscultate lung for breath sounds such as crackles and wheezing. Crackles are caused by fluid accumulation in the airways and by pulmonary edema. Wheezing is related to bronchospasm. Monitor for signs of respiratory difficulties such as nasal flaring, stridor, retractions, and the use of accessory muscles. The breathing pattern alters to increase chest excursion to facilitate effective breathing. Assess for any signs of worsening pulmonary edema. Pink, frothy sputum is a classic sign of pulmonary edema; this necessitates the need for mechanical ventilation. Monitor oxygen saturation and ABGs as ordered. Pulse oximetry is a useful tool to detect changes in oxygenation. Oxygen saturation should be at 90% or greater. Decreasing PaO2 and pulse oximetry readings and increasing PaCo2 are signs of respiratory failure. Monitor chest-x-ray readings. Chest X-ray reports on all submersion victims are done to assess for degree of aspiration and lung injury. Radiographic studies of lung water lag behind the clinical presentation by 24 hours. Provide suctioning as per client’s need only. Hypoxia and the Valsalva maneuver with suctioning may increase intracranial pressure (ICP). Maintain the client’s airway and assist with ventilation as needed while protecting the cervical spine. Maintaining patent airway is always the first priority. Cervical spine injuries should always be considered in victims of near-drowning especially after a dive. Provide oxygenation as ordered. If the client has spontaneous breathing, supplemental oxygenation is administered by mask. Anticipate the need for intubation and mechanical ventilation. The outcomes of pulmonary injury are a clinical picture of acute respiratory distress syndrome: pulmonary edema, atelectasis, hyaline membrane formation, and pulmonary capillary injury. Early intubation and mechanical ventilation are suggested to prevent full decompensation of the client. Mechanical ventilation provides supportive care to maintain adequate oxygenation and ventilation.